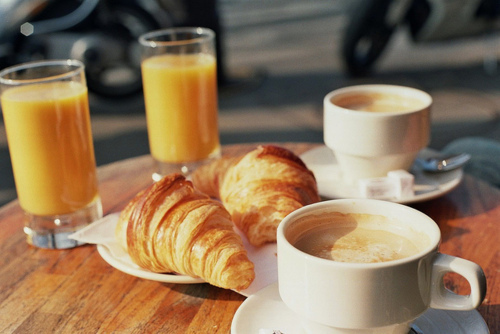 Le petit dejeuner, or breakfast, is one of my favorite times of day in France. Everything about it enthralls me. From the espresso (or café au lait, which I much prefer), to the freshly pressed jus de pamplemousse (it's usually jus d'orange, but lets face it, saying jus de pamplemousse is so much more fun! ), and the fresh baguettes and croissants paired with chunky fruit spreads, is something I go to bed dreaming about. But that's probably because I'm American. It seems to me and my observations that le petit dejeuner in France is really not that big of a deal to the French. There are no French equivalents to an IHOP in France, nor are there any restaurants that cater solely to the breakfast crowd. While at first it may strike someone as odd, the answer is really quite simple: the bakeries. Work in the boulangerie begins around 5am, and the doors open at 7 even on Sundays. The breads and pastries that slide out on to their display shelves often come from recipes drenched in both butter and tradition. 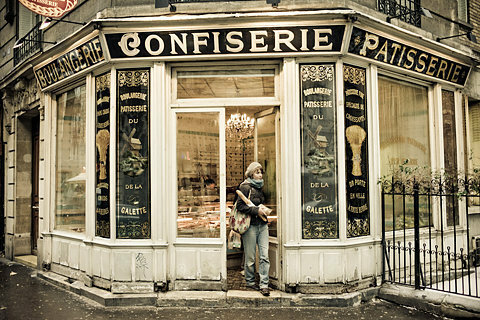 All bakeries have their own specialty - but it's up to the clientèle to find it. One pain au chocolat will taste different from one patisserie to the next. Hence, the same can be said about the cafè's: for the cafe's usually get their bread from the neighborhood boulangerie. There is the toast with a poached egg, and coffee. 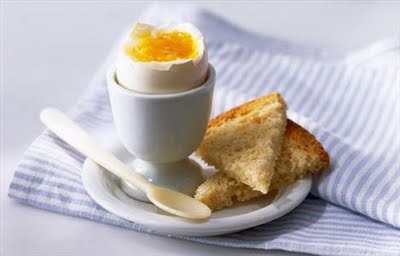 Be sure to dip your toast into your egg yoke! Then, there is my personal favorite: espresso/chocolat chaud/tea with jus d'orange, un petit baguette, a pastry (pain au chocolat svp), and butter and jam. Le petit dejeuner you see, really is quite petit. If there is a concept of brunch in France, I haven't see it (please correct me if I am wrong). Compared to the British and American breakfasts, to some this may seem like a snack. "How do the French survive until their next meal?" You may ask. But ah! 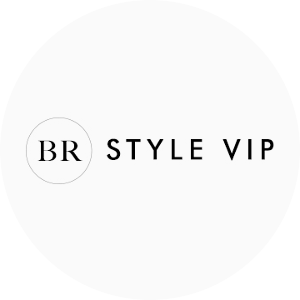 The secret is in the details you see. It's the espresso. Yes, that burnt, bitter, almost sour liquid in your tiny cup is hiding something - and it's not calories. You see, once the caffeine hits your stomach your brain believes that there isn't room for much more in that little belly of yours. Yet your nose, and your eyes they know perfectly well that to resist the buttery, flaky goodness that is French baking would be unforgivable. And the French know that après le petit dejuener is le dejeuner - and to not be ready for that meal would almost be a sacrelige. What about you, readers? 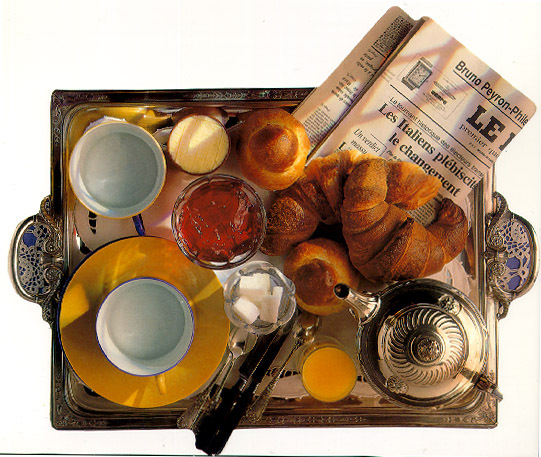 What do you think about the French petit dejeuner? Is it a oui ou non pour vous? Do you have a favorite meal of the day? Oh My! The French really know how to breakfast like a king.I dream of the day when I shall bite into my first authentic croissant and Macaroon in Paris. I love nutella on it's own right out of the jar. Beautiful post as always. I love this post! You're too cute! and pamplemousse is an AWESOME word! Definitely my kind of breakfast! Love it!! 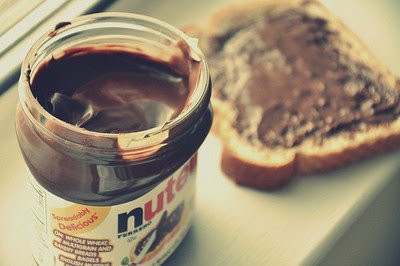 aand omg nutella is amazing! I love this post!! I seriously need to start having French breakfasts. 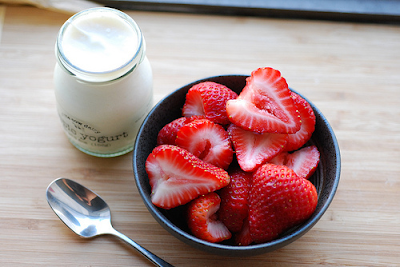 They are so simple and yet so elegant and they look pretty healthy!! One of my favorite books is French Women Don't Get Fat (and the sequel). Have you read it?